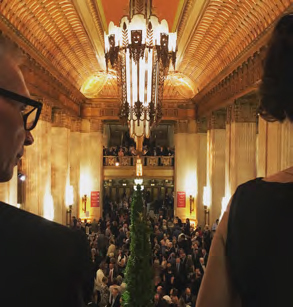 “This is my kind of town, Chicago is…” So go the lyrics of the famous Frank Sinatra song, his paean to the city and its character, architecture, music, people… And with more than 5,195 restaurants (25 of which have Michelin stars! 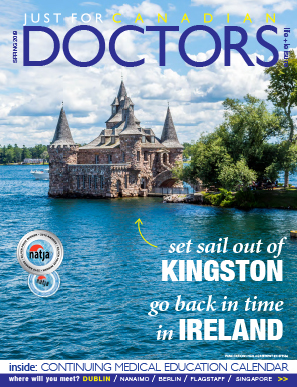 ), 250 theatres (hello Hamilton, the must-see musical that’s on an extended run in Chicago until January 2019), 200 dance companies, iconic opera house, some 56 museums and 700-plus public artworks, Chicago entertains and charms as much as the so-called Sultan of Swoon. Start and stay in the Loop, Chicago’s business district and downtown core, where the historic Palmer House Hotel is the longest continually running hotel in the US (since 1873, when it reopened in grand fashion after the Great Chicago Fire). Step out onto State Street (“…that great street”!) and into the buzz of the city amidst iconic architecture. 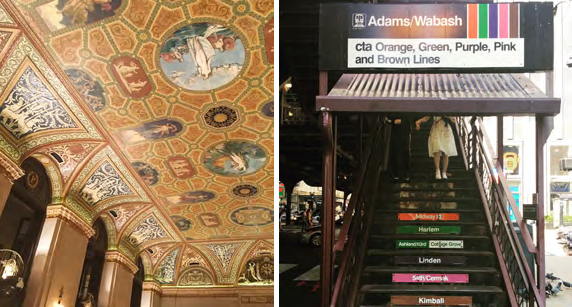 Better yet, take a ride on the “L” train’s elevated circuit through the Loop and marvel at the cornices and columns here, the glass and steel there, and how it all comes together in this cityscape created by the likes of Mies van der Rohe. 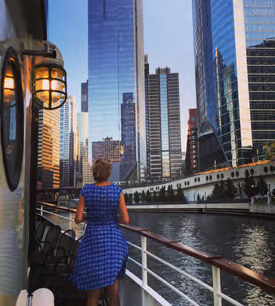 After the train, take a boat on the Chicago River for another perspective on the birthplace of the skyscraper. The towers that skirt the snaking river also seem to embrace Chicago’s go-to gathering spot, Millennium Park. 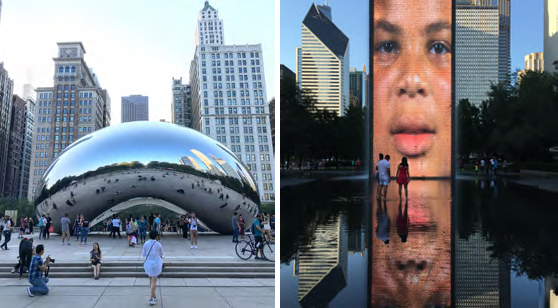 Here, you’ll be wowed by yet more cool structures and art: amphitheatre by Frank Gehry, Cloud Gate sculpture by Anish Kapoor (simply known as “The Bean”) and Crown Fountain by Jaume Plensa. On a hot late-September day, this interactive artwork’s two giant spouting video sculptures become a spontaneous waterpark, ﬁlled with families and foodies taking a break from the Chicago Gourmet fest (September 28-30). More art is just steps away at the Art Institute of Chicago, voted number-one museum in the world (TripAdvisor Travelers’ Choice Awards). 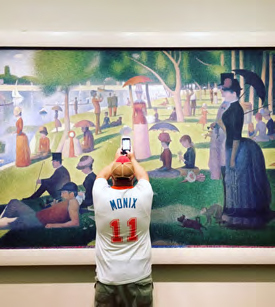 Its permanent collection has 300,000 works, including Seurat’s A Sunday Afternoon on the Island of La Grande Jatte, which has a famous cameo in Ferris Bueller’s Day Off. Stand and stare like Ferris and his crew did (and everyone else). And then, just across the river, there’s the Magniﬁcent Mile (900 stores within eight blocks) and another set of iconic buildings that induce neck craning: the Wrigley Building, Tribune Tower (its façade dotted with stones from historic buildings around the world, including the Taj Mahal), John Hancock Center (now called 875 N Michigan) and Willis Tower (where you can step out over the city on a glass-bottomed ledge—103 ﬂoors up). To the south is the Museum Campus, made up of Adler Planetarium, Shedd Aquarium and Field Museum (home of “Sue,” the world’s largest, most extensive and best preserved T. Rex). Also in the South Loop: Soldier Field, the stadium of the Chicago Bears (da Bears! ), and McCormick Place, the largest convention centre in the US. Walk back towards the Loop with football fans after a Sunday-afternoon game, along “Chicago’s front yard” of Grant Park, for one other must-stop. Lou Malnati’s classic deep-dish pizza. 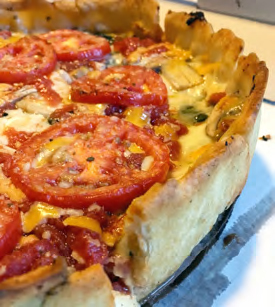 The debate is ﬁerce over Chicago’s best pizza, but you won’t be disappointed with an order of the “Lou” (spinach, mushrooms, tomatoes, mozza, romano and cheddar in a garlic buttercrust). You’re welcome.